The next abstract we will take a look at is "Volcanism on Io: Results from Global Geologic Mapping" by Dave Williams, Laszlo Keszthelyi, Dave Crown, Paul Geissler, Paul Schenk, Jessica Yff, W.L. Jaeger. 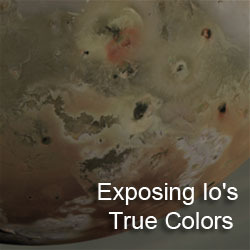 The authors completed a global geologic map of Io over the last few years in ArcGIS™ based on a basemap containing Voyager and Galileo created by the USGS. Their map has gone through peer-review, but has not been published online as far as I know (I'd love to be proved wrong though). 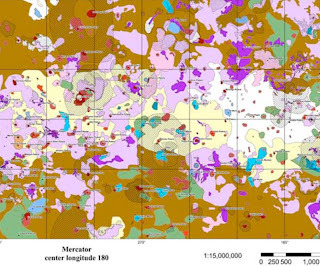 Geomorphologic maps such as this global one can be used to determine the distribution of different terrain types across a planetary surface. Progress on this project was reported earlier at the last few LPSCs, including 2008 and 2009, as well as other other conferences like EPSC. This year's paper will be presented as a poster at the "Satellites and their Planets" session on Thursday, March 4. This year, the authors of the global geologic map will present statistical analyses of the units in the map, which include: plains, lava flows, paterae, mountains, and diffuse deposits. This involves looking at where certain units and sub-units are most concentrated and how different sub-units are correlated. 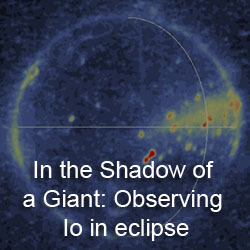 As an example, they found that bright flow fields outnumber dark flow fields 3 to 2. These are considered the youngest flows on Io, composed of sulfur compounds and silicate basalt respectively. They note a concentration of bright flows at 45-75° N, 60-120° W, covered in the area shown at right. Williams et al. argue that this region might be indicative of extensive sulfur volcanism here in the past. An alternative explanation, particular given what happened at Thor (bottom center in the image at right, far right in the Thor link), would be that these flows are older silicate flows that have been coated with sulfur in falling from nearby plumes. While these flows are old enough to be completely coated and turn a bright shade of yellow, they are not old enough to have been converted to red-brown sulfur (S4) through radiation damage. So these flows stand out against the background plains, while at the equator, they might not have been as noticeable. Thus the process of a lava flow aging and becoming indistinguishable from the background might take longer at the poles than at the equator. Comparing the distribution of Io thermal hotspots (indicative of volcanic activity) to terrain type, the authors found that 20.3% of hotspots are associated with dark flow fields, 9.3% with undivided flows (older mapped flows, like the ones at lower left in the color image above), 45.3% with dark patera floor material, 1.7% with bright flows, and 18.6% with other patera floor units. This matches with intuition that recent active volcanism on Io is dominated by silicates. 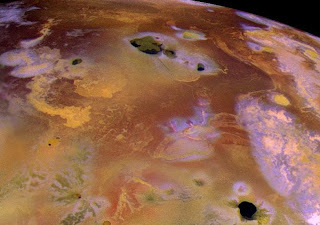 One difficulty that would be interesting to see how they address are surface changes on Io over the course of the Voyager and Galileo missions, and between them. For example, hotspots associated with undivided or bright flows may well come from fresh dark flows that formed after the images used in the basemap were taken, as would be the case for Thor. Activity from Pillan in 1997 would also not be represented in the map since they don't appear in the basemap. In additional analysis, the authors found that lineated mountains tend to be taller than other mountain that show signs of mass wasting. This is as expected as mountains are thought to be uplifted crustal blocks that almost immediately begin to waste away. 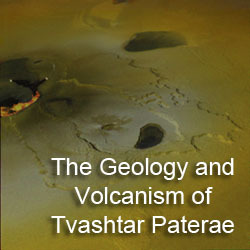 When looking at diffuse deposits, they found that these materials are dominated by condensed gas deposits from volcanic plumes as opposed to pyroclastics, the latter normally associated with transient outburst-class eruptions, like Pillan or Thor, though some pyroclastic deposits seem to be more permanent around some volcanoes like Pele and Babbar. 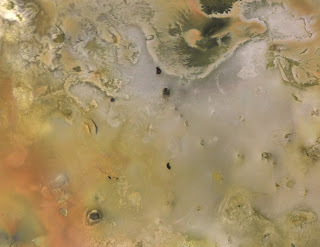 Finally, they note that white plains, composed of sulfur dioxide ice fields, are mostly concentrated along the equator on the anti-Jupiter hemisphere in regions such as Colchis Regio, Bosphorus Regio, and Bulicame Regio. They suggest that this region might be a colder region of Io's surface, possibly due to differences in magma sources, delivery mechanisms, and crustal thickness, but I wonder if runaway thermal segregation, the kind seen on Iapetus, might be a possibility. In this abstract, Williams et al. once again take a look at the global geologic map the group has created over the last few years, attempting to use the map to determine correlations between different surface units and other Io data, such as mountain height and volcanic hotspots. Hopefully, sometime in the next year, the map will be officially published, like the Ganymede map was last year. I ran across this older post and can relay that the final map has been released in PDF and all the associated GIS are available for further analysis.